Once again it is time for Mixology Monday. I had missed the last several but it’s good to be back in the swing of things. This month’s theme, hosted by Andrea at the Ginhound Blog, is Sours. She’s allowing Daisies and Fizzes too, but come on—The Sour is perhaps the single greatest, most versatile class of cocktails to be created to date. When I initially saw the theme for this month I had wanted to cover Jeffrey Morgenthaler’s Amaretto Sour but the booze nerds had already thoroughly covered it for their entry. And I had previously already covered the Daiquiri and several of its wonderful variations when I wrote my series of posts, 7 Daiquiri’s in 7 Days. So the search began for a new sour. I stumbled upon an old issue of Imbibe Magazine in which David Wondrich wrote about the Sirroco Mixture. Directions: with a vegetable peeler, remove the find from 2 small to medium sized limes, in long spirals if possible. Muddle the peels in a pint glass with 2 tsp superfine sugar. Add the juice of the limes, about 1.5 – 2oz. Stir to dissolve the sugar. Fill the grass with finely cracked or shaved ice. Add the cognac, maraschino, and a healthy grating of nutmeg. 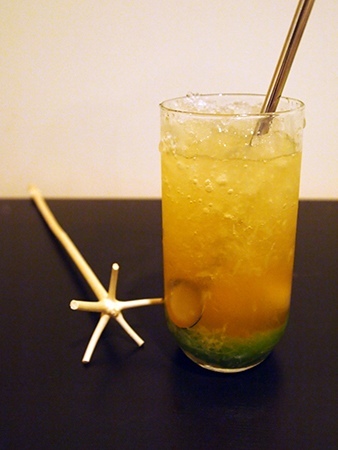 Swizzle and serve with a straw.